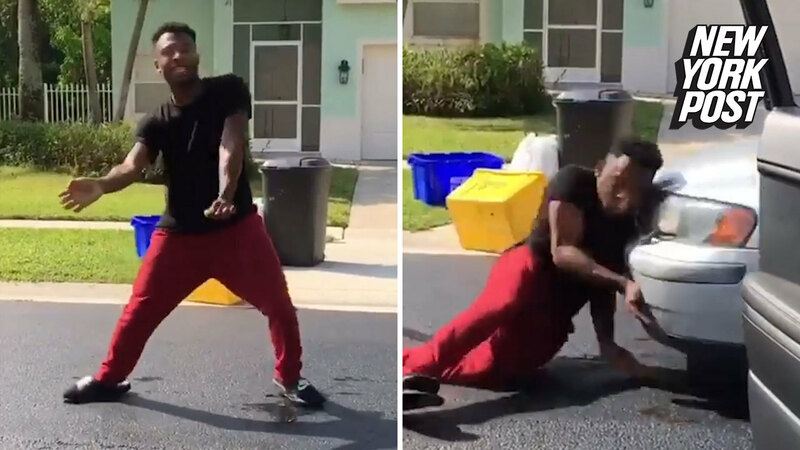 POLICE have warned of the dangers of a new viral dance challenge after a man in Florida was knocked down by an oncoming car while attempting the “In My Feelings” dance challenge. The Drake-inspired craze has fans jumping out of cars — moving or otherwise — to do the dance, which is also called the Keke Challenge. Jaylen Norwood from Boynton Beach in Florida is seen exiting the car as the song plays. He starts dancing on the road but then slips on a patch of oil, and just then, a car comes in his direction and hits him. “I planned this whole thing out. I was gonna do the dance and then jump on the hood of the car and continue the dance but it came too fast and I slipped on the oil and that’s why I got hit by the car,” Norwood said. The video then cuts to a clip of his showing his cuts. Thousands of social media users, including celebrities such as Will Smith, have been posting footage of themselves dancing to the hit song.